Turning only enough to catch his eye Elle shot back. "I've been watching a lot of Gordon Ramsey lately." Which was complete BS, she despised the foul mouthed goon. No simply put, practice makes perfect, or in her case just a little bit better than before. It was time to serve the eggs as she heard the toaster 'ping'. Elle moved out of her chair setting out three plates, they were a gift from Sam to both of them, with Elle being a little upset earlier that even they hadn't jogged his memory. The china plates having a silver edging with the crest of the old British ship HMS Dreadnought on them, Sam had found them at an antique fair. For something extra she grilled some tomatoes just as her mum had done years ago, cutting them in half, sprinkled with parsley and popped under the stove. With the toast nicely done, that went on the plate followed by the eggs with the bacon and tomato on the side, knowing Mike so well, she went easy with the pepper and salt for his, a little heavier with the pepper on her own and average for Coops; even if the shakers were on the table. She placed the plates on the table in front of each of them, feeling a little confused in her mind. Her a warship captain, generally having stewards serving her; doing the housewife thing was messing with her mind as she was afraid she might get to like it. "Which reminds me I have to go into town today to fix up some bills. Will you two be okay without me for a few hours?" She asked, sitting back where she was, looking squarely at Mike trying to stare him into remembering something. "I can imagine. Old Doc Mac did fill me in on a few details Mike, I was thinking that maybe you know, I should tread with caution as there might be some moments you didn't want to revisit so early." Speaking of friends that made him think of that whole crazy time back on the old Alpha Site. "Well I don't know if you've been told or realise this Mike, you did have and I imagine still have a big circle of friends who'd be out there cheering for you; what was that kid's name back three years ago, that young Aussie navy girl Mike was helping along?" He asked randomly. Mike had spent a lot of time with her, pushing the girl to do better. As Coop understood it back then she was quite ahead of herself in med school, then some family tragedy occurred forcing her to quit. He looked Elle up and down in her ever so casual night attire, then at his plate as it was set in front of him. The food reminded him so much of his own mother and very large family, although if it was her serving there would have been twice the amount of everything on the plate. "Don't fall over in shock Elle but this looks and smells really good I-" He stopped dead when he looked up at her again, the face was the same, as still as beautiful as ever though now he could clearly see the strain it had been on her. While everyone was fussing around Mike, his primary carer was falling to pieces. The hollow cheeks were a dead give away as were her thinner arms than usual. "You okay Elle?" He asked as a close friend would, he really wanted to boot Mike under the table, but the poor man just wouldn't click onto it as he was. He ate just as quietly, not enjoying the feeling of just about everybody around him knowing more about him that he did himself. Logic said it was natural, but that didn’t take away the feeling of discomfort. Looking between the two with a bewildered look on his face, it suddenly dawned on him. Even if he was comfortable within these walls, Elle probably wasn’t. Heck, she’d been cooped up with him ever since they’d left that underground facility two days ago. Not complaining one single time, just being there for him, patiently waiting for those rare glimpses or hints of who he used to be. "Damn! Trust Coops to notice!" Elle swore to herself, she thought unwisely she had been doing a good cover up job, but the man was as close to being a doctor as a trauma nurse can get and he knew her all too well in any case. She continued to put up the facade though. "Yeah I'm fine Coops, nothing that a little rest and holiday won't fix." She grabbed her shoulder bag from the hook near the door, hooking it in her arm. "It was Emily Harris, she's a commissioned officer now, fully fledged intern and I know Mike she'd be crediting you with that." Elle left out the part back in the day when the young woman then working as a Sea Air Rescue diver often swore at Mike in Russian when he had to accompany her on flights, he didn't need to know that part. Maybe he'll figure it out himself. "Well I admit it isn't five star cuisine, but it won't kill you either. I have been practicing a little of late." Which went right back to her and Mike's camp out back on the Alpha site a few months ago. "Thanks Mike. I won't be long, bank, post office and the house insurance renewal. One or two other small things and I'll be back. Hopefully before everything shuts. Otherwise it'll be another trip tomorrow." She pushed on the fly screen door, giving both a cheery wave before leaving into the back yard, then the garage for her car. "Yes Emily, that's the one. Cute kid. Drive safely Elle, remember you ain't punting a Humvee around the Alpha Site. And please don't even have us boys on your mind, we're not going to do too much damage are we Mike?" Coops quipped reflecting on a hilarious event back in the good old days when the woman scared the crap out of General Blue on a simple trip into the old Foreston. He can see the man's white face even now which made him wonder deeply, how far he could push into Mike's memories. He for one wasn't giving up on him, not this early. Waiting for Elle to be out of sight and out of hearing range he continued the conversation. "Sweet old girl Anne, I haven't known her long other than by association with Cate and other than she was on the Daedalus when we were hit, although I recall Anne was on the ground with medivac teams right there and then. You are one of her top list favorites Mike, that is something you can feel proud of; not many make it to that list. Does the name Gus Aaronson ring any bells?" As he spoke, he got up and started to clear the table and continued with the rest of the kitchen. ”You see, Horowitz has tried this, long list of names and places. Same goes for Elle, lots of names and pictures, but it all results in me getting a terrible head ache, so Elle and I decided to try something different today. To see what kind of ‘muscle’ memory I’ve got...” He hesitated a moment there to make sure that it was the right expression, then nodded and continued. “Elle thought that my boat would be a good place to start, since neither of us thinks it’s a very good idea to let me loose on a patient in my condition… However, so far, it seems like those situations, the medical ones; is what really triggers my body to remember my training and something of what I used to be.” He briefly recounted the events on Tamora to Coops - the one with the choking girl he’d helped as well as the very sick draft. The latter not ending just as happily as the former, but still, it all had felt so very familiar. Coops helped with the cleaning up, routine for him being a bachelor and all; no one else was going to do it for him. And very typically unbachelor like he was an organized man, needing a place for everything and everything in its place. "He was a mate of yours back in the day on the Alpha Site, he was the Chief Medical officer. I've not seen him for at least three years though, not even sure if he remains with Stargate Command, I guess Elle could find out though. Anyway, moving on. She's spot on there Mike, sometimes memories can be blocked and yet at the same time triggers can release certain things; as a trauma Nurse that was one of my specialty areas, so lets go and see how Celeste can help you along. Although don't count on me for much help in that area, I'm useless with anything that even resembles wood." The whole thing was an immense weight on Elle. While she thought once Mike was secured things would get so much better for her mentally; they hadn't. In fact she felt in the last day it had gotten worse for her, putting her almost at breaking point no matter much she loved the man; this dramatic loss of memory she had to admit was doing her in. Yet typically for Elle she plowed on, doing what she had to do to keep herself in check, all the while hoping that any day now that light bulb would click in his head. Shaking her head she opened the garage door to get this drive to town over with. 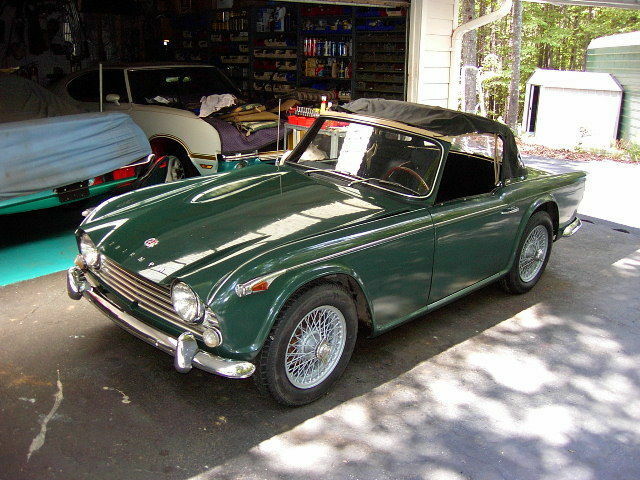 As she passed the brilliant British racing green little sports car, her image reflected back to her; she was still in her PJ's right down to her Ugg boots. Sighing deeply she was about to go back when she remembered most of her things were still in the boot of the car. Putting the key into the almost 50 year old car's boot lid, she popped it open to reveal her over large sports bag, as well as Mike's. That had been in there for near on two months now since weeks before they left for Atlantis. She unzipped her own bag to find jeans, a decent shirt and a pair of Nikes, but no socks. shrugging that off Elle ducked behind Mike's pick up, oh how she loved that thing, especially since it'd hide her. She flung the clothes over the truck's tailgate, got changed faster that Superwoman, then she was back putting her things away and finally after all that she was on her way as the little green Triumph burbled away down the drive headed for Springs. Mike nodded as Coops told him about this Aaronson-person. Again someone he should know, but had no recollection of. Really disturbing. They crossed the area between the back of the house and unlocked the door leading in to the back of the combined garage/work shop. “As long as you keep me company, I’m good,” he said as he entered the area. The roughly 65 by 80 feet room smelled mostly of wood, but there were also traces of chemicals in the air. Along the long side end ran long wooden workbench with various tools hanging on the wall above it. The opposite wall had cupboards, drawers and large windows, letting the morning light from the outside flood in. And right in the middle of the room stood The Boat. "Now that my friend I am good at. I think I can safely say that I've been able to hone my bedside manner across a virtual galaxy which has to count for something don't you think?" At least Coops felt that was one skill he could rely on until such time as he was cleared for active duty again; if that ever came his way. Hope was a long bow sometimes. The first thing that hit him square on his senses was that smell, that heady aroma of timber that has been worked along with everything else that pulled it altogether. It brought back fond memories of doing woodwork in High School, he flunked of course but it was an enjoyable moment in his life; the smell of wood was to a man something like a damned good aftershave. He watched carefully as Mike related to his creation, this could be the start, the place where Mike put his first real footsteps along his path of recovery. "Well I was close, it's the Latin you know Mike. Always did my head in, though now that you have reminded me I think it's more than appropriate. Heavenly isn't it?" He asked as if getting an opinion which he wasn't. "I meant the meaning behind the name?" Now if Mike pulled that out of his head it would be a miracle. As they made their way around, stopping at a ladder, Coops looked up at the beams of the garage in thought at the question of Cate. "I knew her back on the Alpha site, along with a few others. Cate was always a little distant though, she, I don't know Mike, she always looked as if she was carrying a burden of some kind. She had her moments, it wasn't as if she was someone in need of help, no it wasn't that in fact she had a reputation of being quite loud and I think in some way it was a cover up, a facade." He mused on the topic. "She was though along with Elle quite close to you as a friend, I think from memory there was some injury of hers that you saw to for her; that part is a bit of a fog. Since then I only know what I've heard and I guess anyone else from within the Stargate Program knows of her; she died you know, twice and yet the woman is still with us? Don't ask me to explain that, I don't know and that is the truth. But if she hasn't changed since back in the day, she is the kind of person you could turn to. It's as if she owes some kind of debt, back then she went out of her way to help folks and that's saying a lot in this day and age." Mike sat down on the ladder as Coops spoke and when he was finished, he remained silent for a while. It was an intriguing story, although it left quite a few questions unanswered, making him wonder if even half of it was even true. Once you died, you were dead. Even he knew that. "Ah." Coops said blithely as an introduction to something Mike had to know. He sat on a box leaning back on his big paws, then pulled one away swiftly to pull a splinter out with his teeth. "Cate, trust her? Man I'd trust my entire life, my fortune and my family with her. Just cut out the fortune part as I don't have anything close to that." Only partially true, the payout he received in compensation for his injuries was substantial, most of it he gave to his family with all its extensions across the Pacific. "The thing is mate there is something of a wedge between those two. Back in the day they were the best of friends until Elle was slotted in as commander of the air wing on the Hammond, one of our ships. They were engaged in a heavy battle with one of our enemies of the day, the Lucian Alliance- it was one of those wars out of your nightmares." He had to think back hard on it as most of what he knew was either hearsay or the official version which in reality was less reliable than the first option. "The long and short of it is that Cate's father was fleet commander at the time using the Hammond as flag ship; we were running short on pilots during the most critical moments of a major battle. Will, Cate's father took a 302 out I suppose thinking his experience would get him through and apparently it did until his bird malfunctioned and he had to bail. Officially he is still listed as MIA, unofficially we heard an Alliance ground patrol executed him. We'll never really know. In the end Cate blamed Elle for it because she felt as flight commander she had the right to order the Admiral back. According to Elle that was like telling the sun not to come up each day, Colonel Carter agreed and so did Hank Landry back at the SGC. Cate's father went against his own remit and put his own life and that of other pilots on the line that day, but even now she only grudgingly accepts it." No one though could blame her, the girl saw her old man as the salt of the Earth, most likely she still does. "I don't know if they've healed the rift Mike, but it'd still be like two cats in the one small room in any case." Then it struck him like a brick, the thing that Cate claimed she could do. "Dream world? I've heard of shrinks dealing with that, claiming that one day its a possibility for us mortal beings to tap into that but to actually do it? Man, I don't know Mike. If Cate says she can do it and she isn't the kind to say things she doesn't mean unless she's changed over the years; I'd be giving it a go, I mean you can always set boundaries, tell her there are areas that are off limits. You've got more to gain than lose haven't you?" The itch to move around suddenly overwhelmed him, so Mike gave in to the urge, got up and walked over to one of the work benches along the sides of the room. He fingered on the tools in an attempt to try and get a feel for what he’d used them for, then pulled a frustrated hand through his hair and turned towards his friend. Mike was right. The poor man was getting nowhere like this, he was only in Cooper's mind making things worse with the continued agony of not knowing, not fully being aware of his life. That had to hurt and for Cooper it was all he could do to contain himself just watching and listening to his friend's dilemma. "Count me in Mike. I'll do whatever it takes and if that means going over or around Elle so be it. Give me a minute, because I haven't talked to Cate for ages and I need something to open up a conversation with her." He pulled out his phone to do a little surfing, it didn't take long to find what he wanted. But did he still have her number after all this time; two new phones along the way. Checking his contact list he found that she was there, he hit the speed dial and waited. "We're sorry but the number you have called is either out of range or disconnected, please wait while we redirect your call." The robotic voice told him. "Damn!" He swore. "I'm being taken to another number Mike, this will take a while." The phone beeped a few times then began ringing again. "Cate MacGregor here, who is calling please?"